A PR is a PR, no matter how small. I’ve always told myself that I won’t be upset when the result is a PR. If I’m lowering my times and showing progress, I shouldn’t be complaining. So I’m not upset, and I’m not complaining. 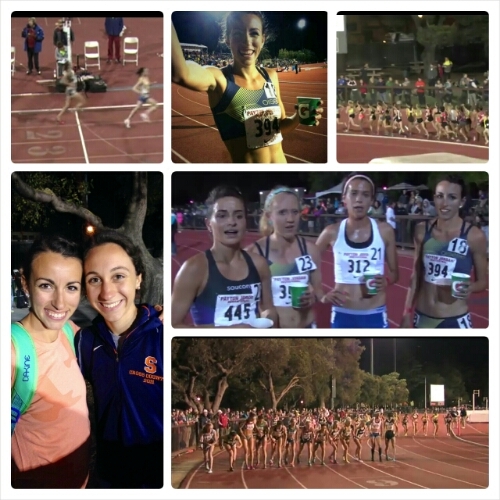 But after my race at the Oxy High Performance meet this past weekend, I do know that I can be even better next time. I tried to remember what I’ve learned from past races. I couldn’t be afraid of high level competition and let myself get shot out the back. I also couldn’t get too anxious and waste energy fighting the mess of the pack. So when the gun went off this time I tried to put myself in it and stay calm. It was going to be fast and I was going along for the ride. I’ve watched the video of my race since and it turns out that I did end up in the back, but I never felt like I was being pushed out. I waited while I watched some competitive shoving and tripping in front of me. I might have waited too long. I had a strong finish, which is good, but I might have had a little too much left. Not enough like a sprinter to go faster for the last 100M, but more strength. I could have gone a little sooner. But a PR is a PR. Lesson learned and it showed me I’m capable of more. Los Angeles was really hot! For the three days we were there, I’m pretty sure the temperature reached the triple digits. I did my shake out run on a treadmill in the gym the morning of the race instead of taking the risk of melting. Nevertheless, I worked hard to hydrate and stay cool, and once the sun went down it was much more bearable. I even warmed up in my track attack pants, true #flystyle. It was great seeing all of the other birds who raced matching in our warm ups as well. As always, it was awesome having all of that support there. I also had my dad and my cousins there cheering for me, and my mom and my boyfriend stayed up very late to watch me from the east coast. I’m a pretty lucky lady! Thank you everyone.